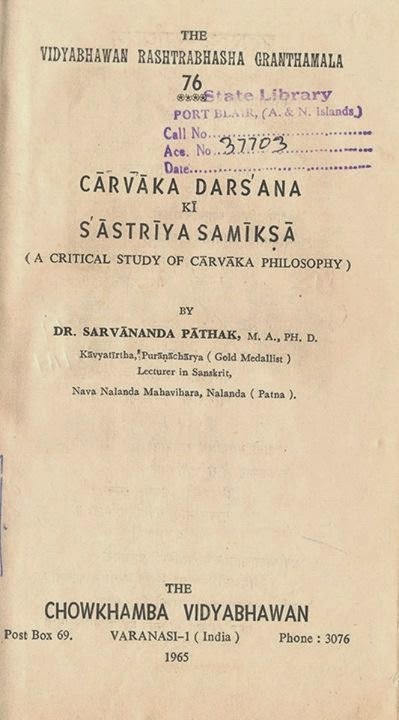 Published in 1965, 'Carvaka Darsana ki Sastriya Samiksa' (A Critical Study of Carvaka Philosophy) gives an overview of Carvaka philosophy. Though the author, Dr Sarvananda Pathak (who was a lecturer in Sanskrit, Nava Nalanda Mahavihara, Nalanda, when the book was written) is critical of Carvaka philosophy (the title of the sixth chapter, in fact, is 'Carvakavad ka nirakaran'), he has reproduced, in the 5th chapter, a wide collection of original writings (in Sanskrit with meaning in Hindi) of Carvaka/Lokayata philosophers selected from ancient texts still extant - ranging from the writings of Kapila, Gouthama, Jaimini, Vatsyayan, etc. 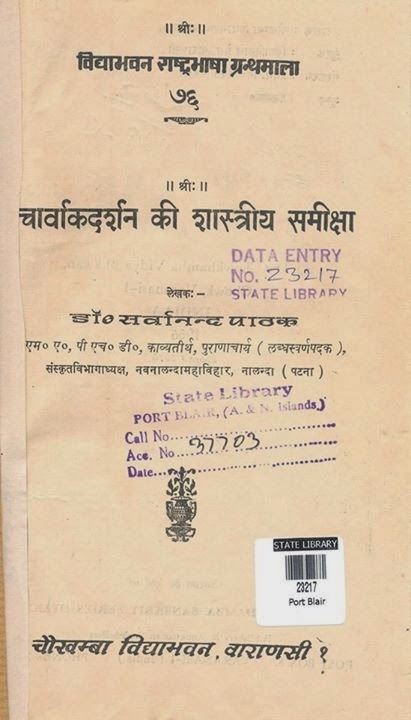 The books from which he reproduced the selections include Ramayanam, Vishnupuranam, Thathvasangraha (Santharaksita), Sarvamathasangraha, Prabhodachandrodaya, Naishadhacharitam, Sarvadarsanasangraha, etc). Dr Ramkrishna Bhattacharaya, an authority on Carvaka/Lokayata Philosophy, however says (in an email sent to us today, 2nd November 2014) that "The only plus point of Pathak's book is the assemblage of a number of primary sources that contain long or short references to materialism. As to his approach, etc. it is almost worthless (as is another book by Kar recently published by Indian Council of Philosophical Research). His collection of fragments is plagiarized from D.R. Shastri. I've mentioned all this in my 'Carvaka Fragments' included in my "Studies in Carvaka/Lokayata".